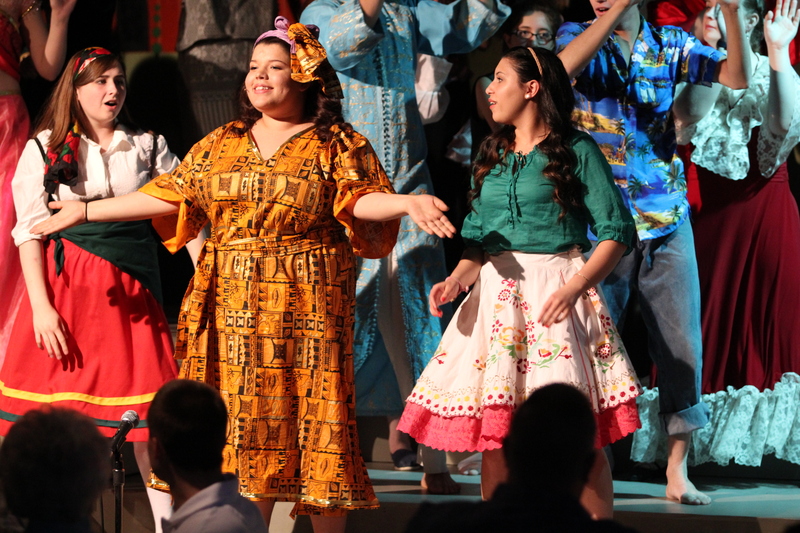 International was the theme for the high school Choral Cabaret this year. In addition to the mural I painted in the background, I made a few costumes. Three girls wanted sari costumes for their performance. I made mock sari’s so they had the freedom to dance but still gave the impression of the Indian culture they wanted to convey. I found the Indian tunic for the boy in the background at the Salvation Army and happened to have white elastic waist pants large enough for him to wear underneath. I first found these discount dresses and a skirt. I later cut the tops off the dresses to make skirts. I found a few matching t-shirts that I transformed into choli’s. I couldn’t find the right pink fabric to make a matching sari from, plus I thought the costume would be too pinky. So I find this purple fabric on sale and added trim with some pink in it. The fabric for this sari was cut from the front and back of a skirt. To add length, I attached some gold fabric and finished to sides with gold trim. After seeing this photo below, I added more gold trim to the sleeves. Luckily, I had this matching green fabric leftover from the school’s Cinderella production to use for this sari. After seeing the performer sing and dance in her costume, I added more gold to the waist and a slit in the back of the skirt, next photo below. The other skirts were wide enough to dance in without cutting slits. To make the stretchy t-shirts fit tightly under the bust, I cut the backs and added Velcro to the top and bottom. 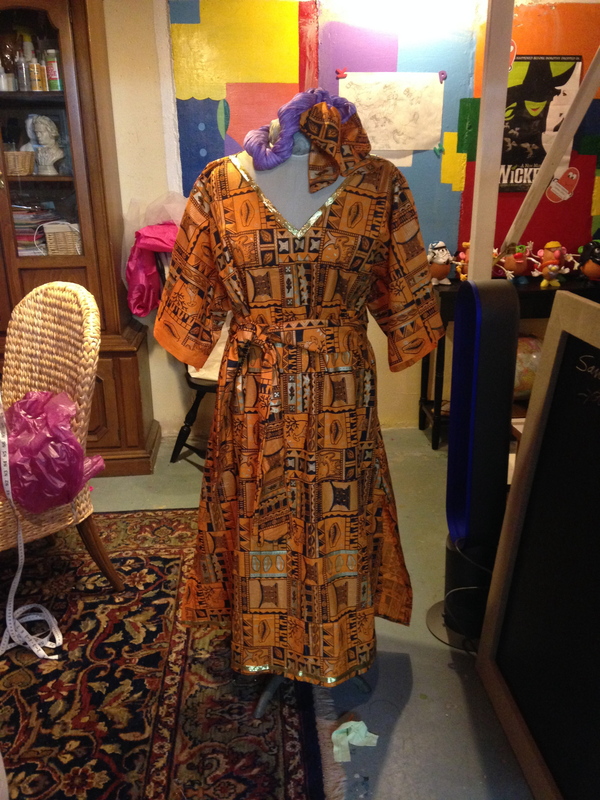 Another girl was having a hard time locating an African costume for her performance so I made this simple long tunic dress with matching belt and headpiece for her. The pattern is sideways, but dealing with the fabric that way was the quickest way to make this tunic, or dress, at the last minute. Plus, I don’t think it was noticeable on stage otherwise I wouldn’t have done it.